Chances are you probably haven't heard the term Paint Protection Film (PPF) thrown around too often. However, you probably have seen this unique thermoplastic urethane clear film before. Initially designed to protect military helicopter blades, this protective film has now made its way into the hands of the everyday consumer. If you haven't heard of PPF before chances are you have seen it already because it has become a popular cell phone protection screen. But, did you know PPF can also be found on sections of your new car? Original equipment manufacturers have begun placing PPF in certain vulnerable areas of the car (e.g. leading edges of a car, hoods, front/rear bumpers). 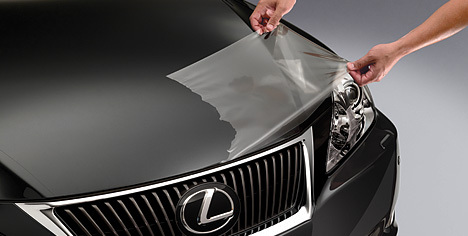 Paint Protection Film helps maintain the beauty and integrity of automotive finish. This urethane film is significantly durable and even helps protect paint from stone chips, scratches, weathering, acidic bug damage and other abrasions. The film is nearly completely invisible and does not alter the appearance of the vehicle. Furthermore, after the Paint Protection Film had taken an extensive beating, it can easily be removed and replaced with a new film. The benefits of this film are instantly apparent as the integrity and resilience of the automotive paint job are intact and in great condition. Additionally, the benefits can be seen in the long run as maintaining the paint job can increase trade in value of your car. Finally, it is exciting to note that Paint Protection Film is being manufactured and cut for thousands of car makes, models, and years. Additionally, film is being cut to mold to more sections of the car thus protecting more than just the leading edges and vulnerable places. Now you can rest assured knowing that there is another durable means of protecting your vehicle. You can order Paint Protection Film from manufactures online and install the film yourself or find a certified application shop. The application process is consumer friendly and there are many videos and instructions provided by manufacturers. There are also alternative protective films that can be applied by spray bottles. For more information ask your local dealership about Paint Protection Film or enter Paint Protection Film into your favorite search engine.